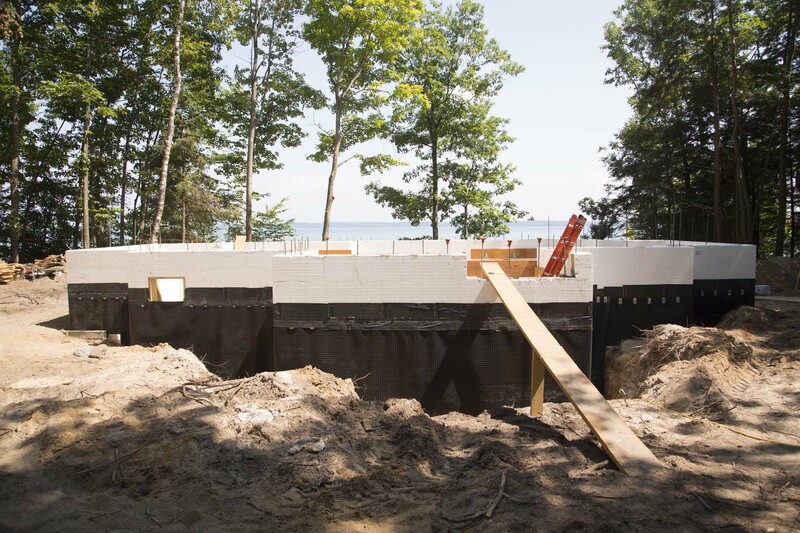 Learn more about Waterproofing, an important addition to any ICF project. Building codes require walls below grade with an interior enclosed space that is habitable be waterproofed. There are many waterproofing systems to choose from. Many of these are widely used and perform exceptionally well. Newer methods are designed to save labor and material costs. Spray-on membranes for ICF are beginning to grow as well but currently depend on the regional skills and availability of applicators. Research options and choose the solution that will provide the best protection for below grade protection for the life of the structure. BuildBlock recommends that all below grade crawlspaces or basements be waterproofed even if not used as a living space. Consult local codes, though if not habitable the choice is yours. In many installations, a combination of materials offers the best waterproofing performance. The primary methods of waterproofing are: peel and stick membranes, liquid systems that are sprayed, rolled, or applied with a trowel, and dimpled drainage mats which are fastened to the ICF walls. A self-adhesive membrane such as Tamko TW-60, Polyguard, or Soprema. 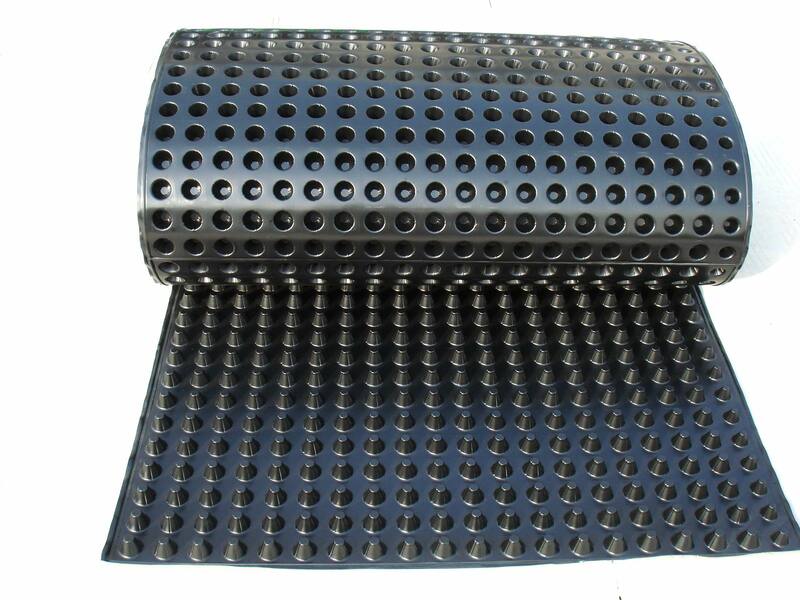 This can also be used in conjunction with a dimpled membrane such as DMX-AG to protect the waterproofing from backfill and provide additional hydrostatic pressure relief. This product is available from BuildBlock. A one-step mat type protection (ex. SuperSeal, DMX-AG). This type of plastic mat provides an air gap between the ICF wall and the surrounding earth. As hydrostatic pressure increases it will displace the air and allow the pressure to be released and avoid attempting to penetrate the wall. It works in many locations that have soils that perk or drain well. May require a membrane in some areas. Other locations that hold water require both the membrane (self-adhesive, roll-on, or spray-on), plus the DMX-AG type mat. When installing a waterproofing membrane, ensure the membrane is mechanically attached using a thin furring strip of wood or metal at the very top of the wall. It is also possible to use basket screws spaced a maximum of 12-inches. This will ensure the adhesive has adequate time to bond to the foam or primer. This is critical in cold and hot weather or when significant temperature changes occur such as daytime heating and cooling overnight. 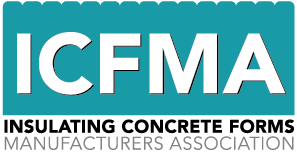 Please review CAD Details in the BuildBlock Installation & Technical Manual, consult the Comprehensive Guide to ICF Waterproofing, or contact BuildBlock Technical Support for more information. Clean the block face thoroughly of debris and remove any yellowing from UV breakdown. You may use a broom, brush, or wash the walls. Walls must be free from all oxidation and debris. Fill any holes or major openings in the foam surface, rasp foam level and smooth with the foam surface. Apply an ICF primer to help the adhesive stick. Precut membrane for lengths for the entire height of the backfilled wall plus 12” above grade and an additional 4” for the base. Attach membrane to the wall beginning at 1’ above backfill grade and roll downward, overlapping 4” and terminating 4” or 6” over the footing. Only remove about 12” of the backing at a time from the top working down as you attach the membrane to the wall. Work slowly and eliminate air bubbles as you work down the wall. Be cautious not to damage the membrane. Seal the top of the membrane with a thin metal strip to keep the membrane from releasing from the wall. The DMX attach brackets may work well for this. You do not want any construction debris to get behind this membrane either. Use an adhesive caulk such as MP1 to seal the membrane against the concrete and seal the bottom edges. It is very important to seal the bottom edge thoroughly. Use an ICF-friendly mastic such as Hydrocide 800 B to cover all terminations and edge seams in the membrane, top and sides, on the outside of all seams. Follow manufacturing installation instructions to attach a protection mat such as DMX at the top of the wall. This prevents damage from backfill material which could punch or tear holes in the membrane. Do not screw into the membrane to attach the DMX or platon products to the wall unless above grade only. Use mastic with a trowel as an adhesive to stick the DMX or platon to the wall. Overlap the dimples in these products and lock the edges together. Use mastic to secure the bottom of the material. Backfill as soon as possible once floor system is in place. Heavy winds can damage this installation if not backfilled once installed. Be cautious when backfilling not to pull down the platon or DMX. Note: BuildBlock assumes no liability on basement waterproofing. 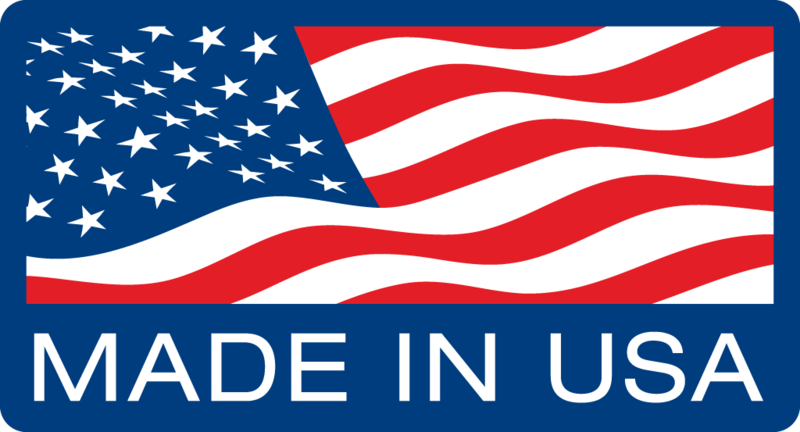 Seek your local supplier for application methods. A leaky basement means problems for years to come. The picture below speaks loudly about waterproofing, basement walls, brick ledges, and how to prepare for natural grade footings that will tie into your basement walls. The dimples in DMX AG™ create a negative side air gap that eliminates the hydrostatic load (pressure) that forces water into the foundation, via cracks and capillaries as discussed earlier. Without the dimples in DMX AG™, the product would be in direct contact with the foundation exterior, minus a negative side clear drainage path, that potentially could trap moisture against the wall should it get behind the membrane and force water intrusion into the basement. The key to the success of the DMX AG™ is the dimple for the control of hydrostatic pressure and ground moisture control. In most cases – highly unlikely when installed properly. However, even if the sheet was damaged and water got behind it, the air gap would prevent water from getting into the home by diffusing hydrostatic pressure build-up and providing a drainage path to the footing tile. Because there is no direct soil contact with the wall, water just drains down to the footing and away through the drainage system. The configuration of the dimple structure allows for continuous flow of water along the path of dimples and air gap to the footing drain and resists the transport of drainage water to the foundation wall. The “conical” shape of the dimple provides a low resistance to vertical water flow and minimizes lateral movement of water, providing maximum protection of the foundation wall from moisture contact with the wall. Absolutely! DMX AG™ will protect everything from a modest crack in a residential foundation to the stone foundations of century-old churches and homes. Not at all! You can use DMX AG™ for under-slab vapor barriers, exterior wall protection, interior wall repairs*, built-up flower beds, retaining wall protection**, around culverts, and many other commercial or industrial applications. Keep watching as we come up with even more! If your application calls for more robust drainage than simply moisture protection, you can use our DMX Drain™ Geocomposite Drainage Boards which are economical and very effective. Yes, but only in areas where there have been extensive geotechnical studies done to determine that a drainage tile is not necessary and the local water tables are not expected to cause any problem in terms of load bearing for the soil conditions. Consult your local Building Code or Regulations on the implementation and requirements regarding the installation of weeping tile or drainage pipes as defined in the Codes or by a Professional Engineer competent in soils investigation.